It won’t be long until the snow starts falling, the roads are laden with ice, and the temperatures dip to the single digits. If you haven’t prepared your HVAC system and your home for winter, the time to do so is now. Rick’s Heating & Cooling is here to tune-up your furnace, perform preventative maintenance, diagnose problems, and execute the necessary repairs to keep your Ohio home nice and cozy. For pre-winter HVAC services from Rick’s Heating & Cooling in Morrow, OH, contact Rick’s Heating & Cooling online or give us a call at 513-899-6005 today! You should shut off your air conditioner before the beginning of winter so it doesn’t turn back on if the temperatures are surprisingly mild. If it is left on, water could reach the outdoor unit, freeze, and threaten the air conditioner’s integrity. Turn off the air conditioner circuit by the outdoor unit rather than simply adjusting the thermostat. Clean all of the grime and debris off of the unit with a hose. Cut grass, hedges, and other growth around the bottom of the air conditioner. Let it dry before covering the unit with a waterproof vinyl or plastic cover. Secure the cover with bungee cords. If you notice any cracks or other flaws on the unit’s exterior, reach out to Rick’s Heating & Cooling for a timely repair. This way, you won’t have to worry about the problem worsening during the frigid season! Think of your home’s furnace like it’s your vehicle. If you don’t schedule regular maintenance appointments, it will eventually break down and create an extremely costly problem that puts a serious damper on your budget! An annual tune-up really does have the potential to save you thousands of dollars in the long run. A furnace tune-up will ensure that your heating system functions as efficiently as possible. Have a pre-winter tune-up performed at the end of each autumn and you’ll rest easy knowing your furnace will generate warm air in the most efficient manner possible all winter long. Your furnace tune-up will also guarantee that you pay as little as possible for your monthly home heating bills. An annual furnace inspection and tune-up even has the potential to improve your health. Let one of our heating and cooling experts inspect your home heating system and we just might pinpoint a carbon monoxide leak that otherwise would not have been identified due to its odorless and colorless nature. Carbon monoxide has the potential to cause all sorts of health problems, ranging from nausea to nasty headaches and even death. Furthermore, a tune-up increases the odds that your furnace will not falter in the midst of a brutally cold Ohio winter. The last thing you want is to be left in the cold in the dead of winter, making an emergency phone call for critical assistance. Instead, let one of our heating and cooling professionals inspect your furnace, identify problem areas, and make the appropriate repairs. Being proactive with a furnace tune-up will help you in the long run! 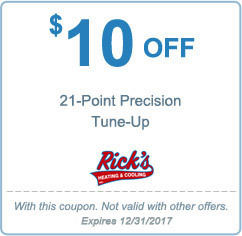 Schedule your furnace tune-up with Rick’s Heating & Cooling today! You can reach us by phone at 513-899-6005, or fill out our convenient online contact form and we’ll be in touch with you as soon as possible.